Fuller and his brother lived in Leiden for some time as did many other English Separatists. Separatist were people who did not believe in the Church of England. The Mayflower left Plymouth, England on 16 September 1620. There were 102 passengers and 30–40 crew. On 21 November 1620, the Mayflower spotted land. The Mayflower was headed for Virginia Colony, but the ship was damaged and they were forced to land at Cape Cod now called Provincetown Harbor. 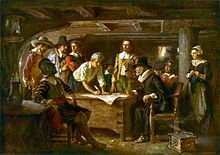 The wrote the Mayflower Compact which was a list of rules on how they would live and treat each other. Fuller signed that document. ↑ 1.0 1.1 1.2 1.3 1.4 1.5 1.6 Johnson, Caleb H. (2006). The Mayflower and her pasengers. Indiana: Xlibris Corp. This page was last changed on 13 February 2018, at 09:38.